Where to go for immediate assistance and what to do if your home is damaged. The California wildfires have destroyed communities; ravaging thousands of acres and leaving many displaced from their homes. If you’re among those affected, you’re probably wondering what to do next and have a lot of questions. We’ve compiled a list of helpful resources, next steps, and information for immediate assistance. Governor Brown announced a state of emergency the past few days for the following counties: Santa Barbara, San Diego, Ventura, and Los Angeles in Southern California. It’s recommended that residents seek shelter and evacuate the area immediately if they haven’t already. 516 Ocean Rd, Santa Barbara, 93106. N-95 wildfire smoke masks can be picked up locally here to prevent smoke inhalation. Please click here for Thomas Fire information on warnings and evacuations. For additional resources, visit the Santa Barbara County official website or http://abc7.com/place/santa-barbara-county/. For additional resources, visit the Ventura County official website http://venturacountyrecovers.org/ or http://abc7.com/ventura-county/. For additional resources, visit the Los Angeles County official website or http://abc7.com/los-angeles/. For additional resources, visit the San Diego County official website or https://www.nbcsandiego.com/news/local/. Most residents won’t be able to return home after the fire(s) are contained, roads are re-opened, and the mandatory evacuation area decrees are lifted. All information on the status of fires, roads, and evacuation areas can be found here. Check the ground for hot spots and carry a bucket of water to extinguish. Examine the outside of your home before re-entering, look for any sparks, embers, or structural issues. If you are unsure or uneasy about the status of your home call the local non-emergency number. A complete list of wildfire hazards can be found here. Updates for your company re-opening will need to be gathered from your management or HR department. What if My Home is Damaged or Destroyed? Document all damages with photos and also keep a written list. Contact your insurance company to file your claim ASAP. When the adjuster arrives, make sure all damages are noted in detail by them. Re-contact your insurance for do’s and don’ts, next steps, and a better understanding of your coverage. Follow-up often and make sure you understand the process 100%. If your home has been damaged beyond repair, there may be an option available to help you rebuild your home. The FHA 203(h) program helps victims obtain new mortgages to purchase or rebuild a Single-Family Property. Home Owners or Buyers living in Presidentially–declared disaster areas may qualify for this program and can apply within one year of their disaster. 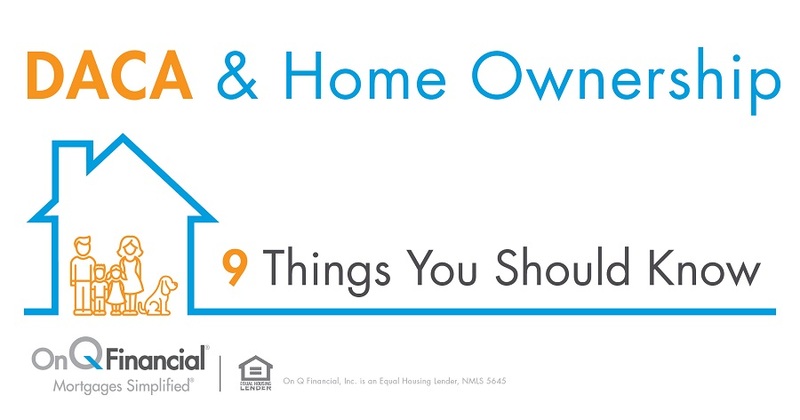 The FHA 203(h) mortgage program helps people re-achieve their dream of homeownership. 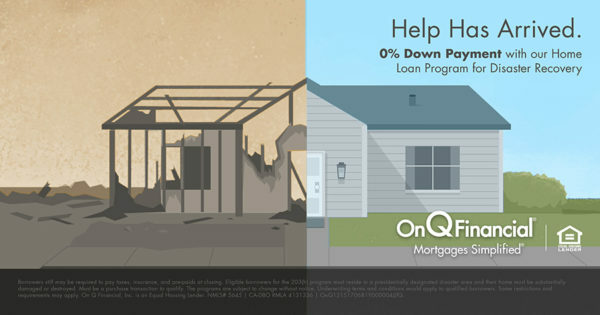 Contact an On Q Financial Mortgage Consultant so we can help you.